A marked feature of war (and comment on war) in early 1915 was, as Clark observes in the Words in War-Time archive, the labour shortage which arose following the departure of some two million men to the Front. Historically, this would be resolved, at least in part, by a range of changing opportunities for women to enter the workforce. In terms of language, as the Words in War-Time archive documents, this would, however, bring opportunities of a different kind – generating constructions which, in various ways, reflected women’s increasingly visibility outside the home. By March 1915, there were some ’10,000 Women War Workers’, the Daily Express recorded. Language and the women war worker, as Clark realised, offered yet another fertile domain of enquiry in his attempt to fuse historical principles with the documentation of on-going change. The novelty of such transferred roles under the exigencies of war would, in fact, generate plentiful evidence of relevant words. Agent nouns such as porter were, for example, formally unmarked in terms of gender – but their use, and meaning, had traditionally been constrained by underlying assumptions of male as norm. For the Star, for example, change in this respect was, in another telling combination, made to constitute a war phenonomen in its own right. Here the move from from porter to woman porter is described in ways which extol female willingness to ‘do their bit’ even as a certain surprise is evoked at women’s successful adaptation to the roles now being extended to them. Another war phenomenon has appeared in the person of the women who understands time-tables. She does not speak of ten minutes past twelve, but of 12.10 with all the glibness of an accustomed traveller. She does not come panting on to the platform one minute after the train has gone, nor stand helpless amid a pile of luggage. If she is surrounded by luggage it is not her own, and she is far from helpless, for she is the new woman porter who has sprung into existence at Marylebone. Traditional gender stereotyping – and its discriminatory overtones — could, as this suggests, both be challenged, and reinforced, in this respect. Woman porter, as other evidence in the archive proves, would by no means be an isolated example of this form. A similar article in the Daily Express, also from April 1915, celebrates the endeavours of the porters in petticoats for whom changed social roles – and sustained femininity – are made to unite. Evidence in the modern OED, we might note, can remain distinctly at odds – lift-boy, for example, is the sole form it records. Lift-girls do not appear. ‘Lift-boys always have aged mothers’, and ‘Chauffeurs, waiters, lift-boys…they are the operators’ states the accompanying evidence, in citations from 1904 and 1967. The Words in War-Time archive will therefore often tell a somewhat different story – tracking the changes by which gender and identity were represented and recorded in response to the social and economic pressures of the war years. By May 1915, the Daily Express was even extolling the advent of the ‘the First Call Girl’ – a form which is, however, perhaps likely to be read with raised eye-brows when read outside the immediate context of war – and the register of the theatre on which it depends. As the OED confirms, a call-boy, is ‘a youth employed (in a theatre) to attend upon the prompter, and call the actors when required on the stage’. Call-girl in the OED has very different resonances (call-girl (orig. U.S.), ‘a prostitute who makes appointments by telephone’, being dated to 1940 with the evidence ‘Call Girls Die Young’). 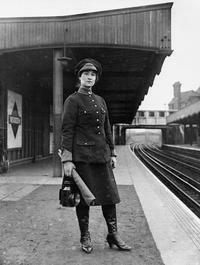 The call-girl of 1915 instead epitomises other aspects of war change. ‘Innovation at Shaftesbury Theatre’, as the Daily Express proclaimed. Perhaps especially interesting in early 1915 is, however, the diction of the war woman. ‘The manner in which war is affecting the character of woman is a matter of vast importance’, the Daily Express commented. The war woman who appeared, for example, in the title of a series by Miss Lorette Aldous, linked what was described as ‘real history’ (located in the female experience of war, on both Home and Western Front) with ‘a modern woman’s ambition and revolt’. Like her antecedent the new women, the war woman is thereby rendered interestingly transgressive; if she emblematises modernity by means of her confidence in taking on new activities in the public realm, she is potentially dangerous too, offering dissent, discontent, as well as ambition. As later posts will explore, such conflicted images can remain in evidence across the remaining years of war, as well as in its aftermath when women, no longer required to ‘do their bit’, were expected to retreat, invisibly, into the life of the home. ** Revision of the OED in March 2008 traced usage of airwoman to 1910. No evidence for the war years is provided, however, and a gap of 30 years intervenes in evidence after 1911. See airwoman, n.”. OED Online. December 2014. Oxford University Press. (accessed January 29, 2015). During the war the form ‘woman secretary’ is not generally used which fits my perception that the transition in business is already well underway even if the war is massively speeding it up. But this form was used twice in The Times during the war in both cases referring to the arrest of the ‘woman secretary’ of a political group, in February 1916 it was the Anti-Conscription League and in August 1917 the British Empire Union. This suggests that when it came to the secretary of a political organization there is still an assumption that this would be a man. Clark has some interesting evidence on the woman as ‘typewriter’ in his War Diary, when he notes that the bomb-dropping (in May 1917) had kept Major Caldwell’s ‘typewriter’ awake during the night, and she had then overslept, with the result that she was an hour late for work. This meaning of typewriter, in the sense of ‘someone who types, as an occupation’ is, as the OED confirms, clearly female-centred. See, for example, the quotations it provides (the second one is particularly good ! ): 1887 St. James’s Gaz. 22 Dec., Women..beat them [men] altogether as type~writers and ‘dry-goods clerks’. 1895 How to get Married 86 ‘The marriage of the type-writer and her employer is so frequent that it has passed into a joke’. Here, Clark’s evidence provides a useful post-dating for a change ! The OED entry was written in 1916 though so there is scope for change !